The Query Editor is a powerful tool within Wwise, yet most people I talk to either aren’t aware of it or never use it. With the Query editor, you can run searches in your project to easily make multi-edits, tag items, and even troubleshoot bugs. This post aims to lift the curtain on the Query editor to give users a better sense of how to wrap your head around this tool and become Wwise Power Users. Queries have their own tab in the Project Explorer and like other tabs in a Wwise project this represents a folder in your Wwise project. You can add work units as needed and create or duplicate and modify the existing queries to drill into the system and find what you’re looking for. Think of a query as a kind of mini-report. If there’s something you’re trying to track down or you want to see all of the objects in your project that are set to a specific value or using a specific RTPC, you can use a query to generate a list showing these objects. 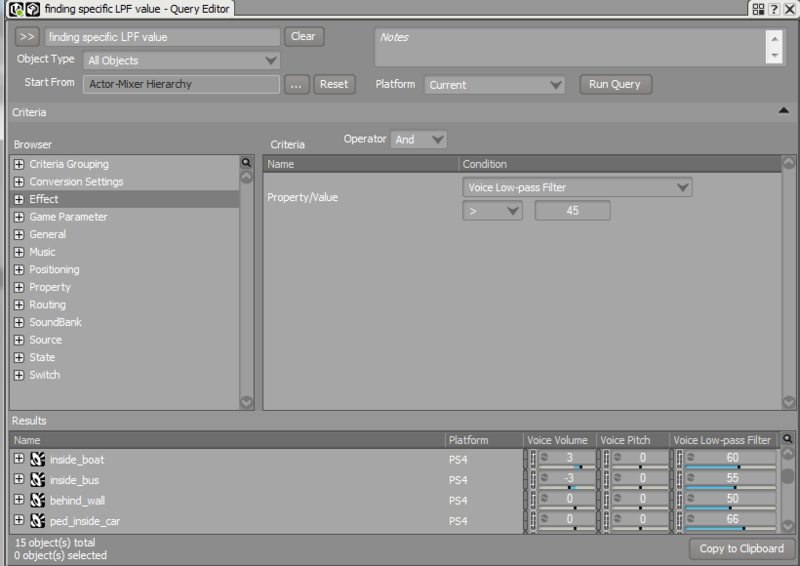 At the heart of the Query system is the Query editor. When we open a Query in Wwise, we are shown the Query Editor. We’ll break down the components of the Query Editor, but it is worth noting that it’s a fairly complex tool in regards to the number (and nesting) of settings you have access to, so it is highly recommended to spend some time with the interface to become familiar where some of the common settings live. 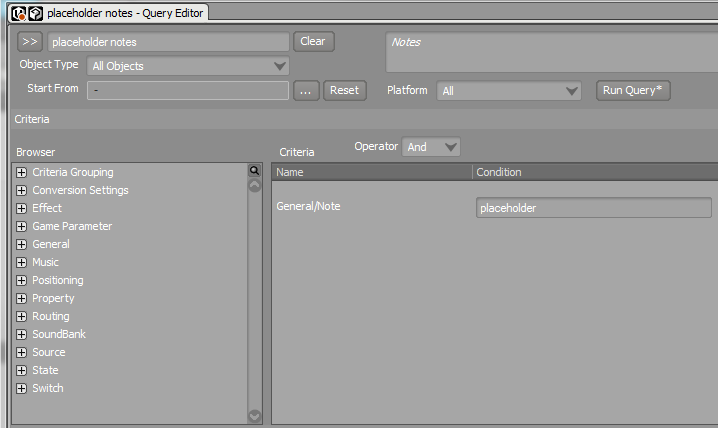 The top of the Query Editor shows us the name of the current Query and from here the information begins to flow down. The first thing we need to do is decide what type of Object we want the system to find. This can be any structure within Wwise from a Sound to a Random Container to a Music Segment and so on. Click the drop down in the Object type and scroll through to see all the options you have. Whatever you select here will be the object type that Wwise returns when you run your Query. If you want an inclusive search of all structures in your project, select All Objects. Next you can choose where you want the search to start from. Clicking the ellipsis next to the “Start From” box will open up a window where you can select a place in the Actor Mixer Hierarchy or the Interactive Music Hierarchy or the entire project. Wherever you choose, the Query will perform a recursive search from. So if you choose the Actor Mixer Hierarchy it will search every structure in every work unit, whereas if you select a single work unit, it will only search through the contents of that work unit. You can also select the Platform if you’re working on a multi-platform project so you can search for All platforms or just a single one if you need. The browser section of the Query Editor is the meat of the system (or the protein-rich meat substitute if you’re vegetarian). The browser contains a series of collapsed categories and it is here that you can begin to select the logic and parameters you wish to search for. While this is the most powerful part of the Query editor, it is also unfortunately the most obtuse as well. It is often not super intuitive to find the parameter you’re looking for as it may be buried in a category you weren’t expecting, or given a generic name with a dropdown that will reveal the settings you’re after. Fortunately, if you’re on Wwise version 2015.1 or later you have the ability to search and filter within the browser by clicking on the tiny magnifying glass above the scroll bar. This will bring up a text field which you can type and the contents of the browser will filter its contents to what you’re typing. My advice is to actually spend a little bit of time looking through all of the categories in the browser, open up each one, click each option and see what lives in there. Having a cursory knowledge of these contents will help you create more powerful custom Queries later. When you select an item from the browser window, it displays in the Criteria window to the right of the browser. The Criteria window takes these generic categories and allows you to get a bit more specific with a variety of tools from simple drop downs and checkboxes to conditional statements. In the example above, I am looking for objects which use a specific RTPC. 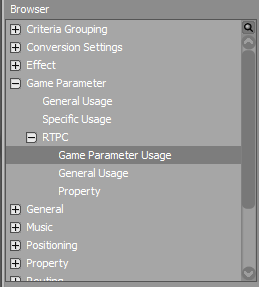 Also notice that the Criteria name shows you where in the browser that specific element is located (Game Parameter -> RTPC -> Game Parameter Usage). This is another area where the depth lends itself to a layer of complexity that is best understood by actually clicking through some of the options to see what is available to you. Above the criteria window is an Operator dropdown. When you create multiple criteria for your Query, the operator allows to you say if you want all of them to be required to return objects in your search (And) or any of them to be allowed but not required (Or). Once you have all of these pieces laid out, you’re ready to let Wwise do the work. Click the Run Query button at the top of the editor, and if there are any objects that match the Object Type and Criteria in the scope of your search they will display in the Results window at the bottom of the Query Editor. From here you can select them and do a multi-edit or you can begin looking at individual objects to make adjustments or troubleshoot. Essentially, what you’re doing with the combination of criteria and operator is creating a simple logic question for Wwise to answer. If you’re trying to find information about some sounds in your project, another way to approach it is to write it out a question and then build your query based on the criteria you’ve written out, such as “What sequence containers in my weapons actor mixer are set to continuous and use a trigger rate of less than 0.25 seconds?” To create a Query to return these objects, set your Object type to Sequence Container, set Start From to your weapons actor mixer and select Property values for continuous playback and Trigger rate (which you’ll set to < .25). Make sure the Operator is set to And and you’ve just answered your question! For those of you who have ever worked on multiple platforms where you needed to make platform-specific tweaks or changes to various objects, you know all too well the process of unlinking parameters from the “global” state of Wwise and having platform specific values. (For the uninitiated, you can break the connection of a slider and have Wwise apply different values for different platforms. So if you were working on a game where, for example the PC version had a different mix or number of variations than the Android version you do this via unlinking in Wwise). In projects like this, it’s common that some objects are unlinked but the majority remain linked. Perhaps you want to see all the objects in your project that are unlinked to get a sense of how different the platforms are. The image above is Audiokinetic’s preset for Objects with Unlinked Properties Query and it will do just that: show you all objects with unlinked properties. 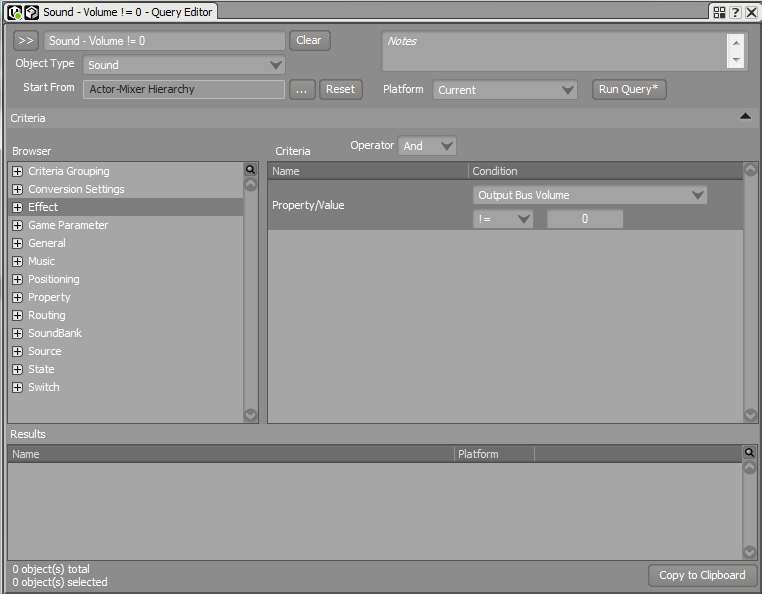 If we look at the Criteria in the Query Editor we can see that it’s basically looking for any objects (due to the OR operator) where the Volume, Pitch, Low Pass or High Pass filters are NOT linked. This Query will then return all objects in your project that have one of these objects unlinked. Drilling down through the Factory Queries is a great way to get comfortable with where various items live and what their tweakable parameters are. Lets look at another couple before making our own. I’ve had bugs in my projects more often than I’d like to admit where my sounds are suddenly inaudible. Usually I’ll use the profiler to try and track down what is going on (which is fodder for a wholly separate article). The issue often lies with the additive nature of filters. I may have a low pass filter on a sound, and then a state or two may be active which also tweak the filter. The exponential nature of the filter means that while each of these modifications may be minor, they add up quickly to muddle the sound to the point of inaudibility. When troubleshooting what may be causing the excessive values, I’ll often look at the voices tab in the profiler and if I see a pattern in the LPF values or abnormally high values, I’ll then run a query looking for LPF values either at an explicit number or above a certain value. The image below shows a query of all objects with an LPF value greater than 45 as well as some objects it has returned. Note that you can change the conditionals in the criteria so you can look for values greater than, less than, equal to, etc., to pin down what you’re looking for. Now let’s say you use the Notes field in your project to help communicate with your Future Self about the state of things in the project. For example, when you add a placeholder sound, you add a note in the Notes field saying “placeholder.” With Queries, you can easily run a report to find all those sounds with a Note that reads “placeholder.” In the General section of the Browser is the item for Note. Type “placeholder” into the Criteria, run the Query on your project, and voila! All your placeholder sounds appear in the Results window. From here you can Copy them to the Clipboard to create a list for your reference, multi-edit them to remove the note, or modify them as you wish. So hopefully now we understand the basics of the Query Editor. Let’s create one for ourselves! When adding music to the Interactive Music Hierarchy, the Music Segments are not set to stream by default and doing so manually requires drilling down a few containers to get to the Music segments to tag them as streaming. It’s kind of a pain when importing multiple files at once. So let’s create a query to find all music segments not set to stream. Once we get these, we can easily multi-edit the list to make the ones we want stream. Next we’ll want to build our new query. I’m only concerned with Music Tracks in this instance since those are the music objects which contain the Streaming flag, so I’ll set the Object Type to Music Track. I select my Start From point as the Default Work Unit in my Interactive Music Hierarchy. In the browser, I open up Property and double click Value to add that item to the Criteria. I select “Is Streaming Enabled” from the drop down and keep the checkbox unchecked. Now this will find all Music Tracks in my Default Work Unit that are not set to stream. 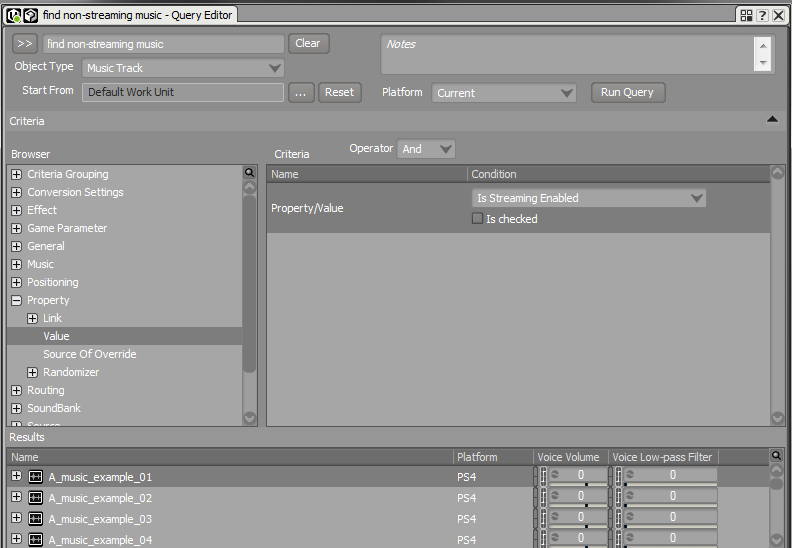 I click Run Query and a list of non-streaming music tracks will display in the Results window at the bottom of the Query Editor. I can now select those I want to stream and press Ctrl+M to bring up the multi-edit window and check the box to Enable Streaming. All done! And that’s a cursory view of using the Query editor and how it can help you troubleshoot bugs and speed up workflow. It’s a very deep tool and one that definitely takes some playing around with to really grasp the breadth of its capabilities. If you are looking for information about content in your project, you can find what you need using Queries. The Factory Queries provided are a great jumping off point, followed by experimentation on your own and sharing/discussion with the community. What is shown here really only scratches the surface, and the level of complexity you can build with queries is really only limited by your imagination. Like any tool in a game developers toolbox, Wwise is a deep, complex program with an owners manual longer than most novels. Who has time to read through an entire manual these days? I wanted to show off a simple, often overlooked feature in Wwise, which may not be readily apparent to someone who hasn’t read the manual. The ability to import a folder structure and apply a Wwise structure as a template to it can save a ridiculous amount of time when setting up structures which may have a similar layout to other ones already in your project. With a little forethought and a few mouse clicks, the process of setting up complex structures in Wwise becomes an automated dream. 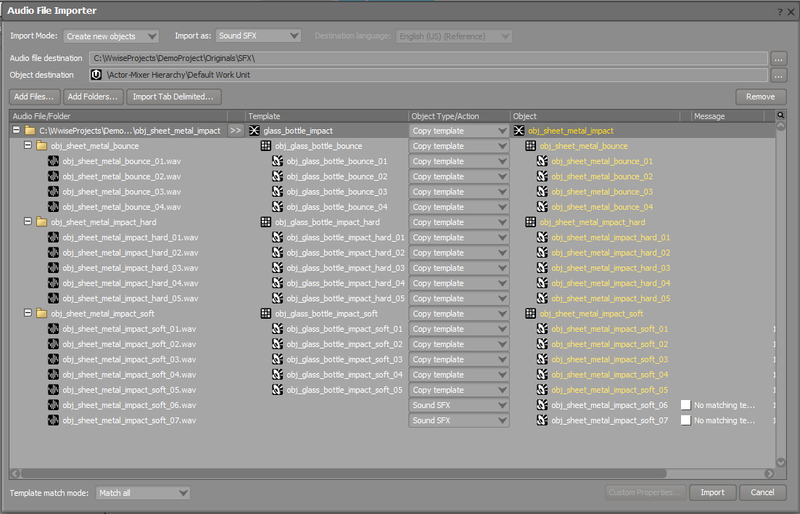 Similar to the blend container in Wwise example above, we have a “master folder,” in this case obj_sheet_metal_impact, which contains three folders: bounce, impact hard and impact soft and within each of those folders are corresponding wav files. With a folder structure in Windows that mirrors the structure we want in Wwise, we can import into Wwise complete with all of our bussing, RTPCs, crossfades, etc. created for us! (As an aside, I always build my folder structures directly in the Originals folder so that the organization is already in place without having to move wav files and folders around as an extra step in the File Manager). 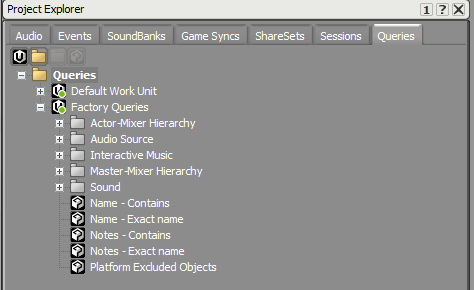 As you can see Wwise automatically fills in which structure each folder should represent and even handles having more (or less) audio assets in a folder. Shuffle things around as/if needed, then click Import, and you’ll have a new structure mirroring the template structure complete with all rtpcs, crossfades, etc. Once we import the folder structure using an existing structure in Wwise as a template, we’re then free to tweak it to our hearts’ (or games’) content, but most of the grunt work has been taken care of through some simple folder organization. Happy templating! We had the run of the place from 8am until 4pm on a gray, overcast Tuesday. 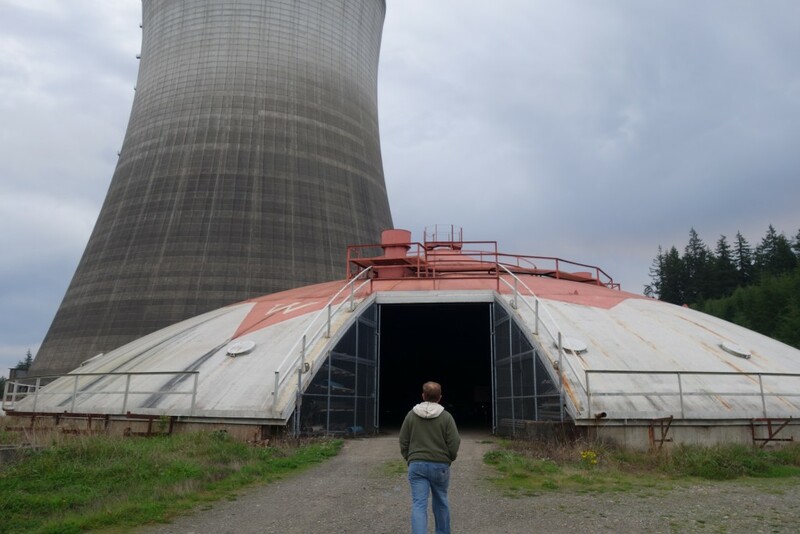 I’ve seen the cooling towers from the freeway on the way to the Olympic Peninsula, but it was a completely different thing to be standing right under one. They were huge! We signed releases to climb up the stairs along the outside all the way to the top, but alas, we didn’t have time. We did walk around though, scouted out a space to do our glass breaking and also scouted some areas to capture impulse responses and the like. The picture below shows one of these spaces: what was meant to be a cap to an unfinished containment unit is now a parking garage with some insane reverbs inside. Andy walking into the bat cave, aka the cap of a containment vat turned into a parking garage. We burned the morning trying to figure out how to rig the glass. James wanted the break sound isolated from the debris that would come with just throwing the panes on the ground. While he was working on figuring that out, Andy and I did a little exploration into a side alley which had some amazing reflections that changed radically from the entrance to the back of the alley. In the back of the alley were some 15 foot long pieces of rebar that we started playing with. Andy grabbed one and started dragging it along the floor and the sound was insane! So we recorded a bunch of that and some other rebar in the alley fun. By then, we had gotten the maintenance crew to bring a man basket lift (a silly, sexist name if there ever were one) and we began figuring out how to get the glass set up so it could be broken safely with a few milliseconds between the impact and the shard fall. The plan was to have 2 people on the roof of the moving van we rented, but the roof was fiberglass with a few metal support ribs. Good thing Andy is a small human! He was volunteered to be the man on the truck breaking the glass. The rig called for a rope running from the truck with 2 suction cups attached to it, going up through the man basket and back down to the back of my car where we tied off so we could easily hoist new panes of glass up for each break. Andy would break each piece with a hammer or crowbar and await the next one to be hauled up. We set up a ton of mics through Kristoffer’s Nomad recorder, 4 Sound Devices 702’s and a couple other field recorders. I think in the end we had a Sennheiser MKH8040 stereo pair on the truck pointing toward the impact. James and Pete and I each had 8060s pointed at the impact areas. We had Pete’s Neumann binaural head (aka Fritz) near the impact area as well as a few other close mics. I had a Shure KSM141 stereo pair pointed at a concrete wall just off from the impact zone to capture the reflections and Andy had his Omni M/S rig in the alley we were playing in. We also had a couple contact mics set up in interesting places (attached to a small satellite dish and one to the rental truck) which actually got some pretty decent recordings. Kristoffer ran the main recording area, capturing 8 tracks from around the impact site into his Nomad. Pete and James were both operating their booms, Andy was destroying, and I was tucked into the cab of the truck recording with my 8060 and monitoring Pete’s rig. In between breaks we all ran whatever tasks were needed: Pete would sweep out the existing glass, James would prep the next pane, Kristoffer logged the recordings and helped me with stopping some of the remote recorders, and I would stop the remaining remote recorders, get in my car to lower the rope and raise a new pane, then run around in a tizzy turning the recorders back on and hopping in the cab to do it again. Chaotic sonic fun! Satsop is a business park and there’s some other industrial areas nearby including a power plant, so it is not a completely quiet place. We were plagued throughout the day by truck backup beeps, riding lawn mowers, strange radio squawks, wind, etc. But we got some surprisingly clean and diverse recordings of a broad range of glass from mirrors to plate glass to bottles to wine goblets (which made an awesome whooshing sound as they traveled through the air) and lightbulbs which sounded way more powerful and percussive than their size betrays). It was a super successful day, but unfortunately we had no time left after breaking all the glass and cleaning up to record anything else. We’re planning another trip soon hopefully to capture impulse responses of various rooms, buildings and spaces (1000 foot tunnels!) and whatever else suits our fancy. Here’s a compilation of some of the breaks I captured with my Sony RX100 camera. The recordings via our Rycotes sound much cleaner (no wind) and as far as those truck beeps, well that’s what RX is for! The Dualshock 4 controller connects via bluetooth and with bluetooth comes inherent latency. For this reason, you really shouldn’t try synching the controller speaker with the game speakers. It just won’t work consistently well. Maybe it will one time out of a hundred, but every other time, it’s going to be off by some amount, which can be a little disorienting. The discrepancy between the timing of the controller speaker and game speakers is fine for more amorphous sounds, but for anything the player needs sample accurate cognition of (like critical dialogue) choose one or the other. There are some really cool techniques you can do with dialogue, which I’ll touch on further down. The LFE channel of a surround system is commonly known as the subwoofer (the speaker it plays out of), but LFE itself stands for Low Frequency Effect. The key word here being “Effect.” If you’re constantly hitting the sub with sounds, not only does the mix start to feel muddy and fatiguing, but you also dilute the power of the LFE’s intended purpose: to emphasize key, special moments or events. I strongly believe the controller speaker should be used in the same manner. Make sure what you’re sending through it has purpose and reason. Generally speaking the best sounds to send through it are UI/notification sounds and “first person” sounds, or those that make sense to the player when they emanate directly in front of him/her instead of in the landscape of the room speakers. By no means are these the only categories of sounds you can use the speaker controller for, but it’s good practice to ensure you’re not breaking immersion through its use (unless of course that’s your intention). As designers, there are a lot of unknown factors we need to consider when deciding what to pump through the controller speaker. Listening environments vary greatly and sometimes the noise of a child crying, a dishwasher running, or a friend yammering endlessly about how awesome they are can completely overshadow the sounds coming through the controller speaker. Furthermore, users can adjust the speaker volume in the system menu, and while there are now ways to query that volume and ideally use that information to determine whether to route a sound through the controller speaker or the main mix, it bears considering that sounds you want to emanate from the controller speaker may not be heard by the player. For this reason, I recommend not using it for any critical sounds that the player absolutely must hear. Whether or not you follow this advice, always design a contingency plan for any controller sounds you want to ensure the player hears. If they’re using headphones, if the controller is turned down, etc. In a perfect world, the PS4 would know via its HDMI connection what the audio setup of the user currently is (headphones, stereo, 5.1, etc. ), and with a microphone attached to the system, we could be sampling the ambient noise of the room and adjusting the mix dynamically as Rob Bridgett suggested in his recent GDC talk on adaptive loudness. If these two concepts were achieved, the engine could determine when to send your controller sounds to the controller speaker and when they need to be diverted to the main mix instead. But until we get there, have a plan in place for controller sounds the user must absolutely hear. The speaker controller is a fun tool and can really add an extra level of immersion beyond the normal mix. We received a lot of positive feedback for our use of it in inFAMOUS Second Son: from the ball shakes of the graffiti can to the way we used it for draining powers (the drain sound started at the source of the power in the world and slowly moved into the controller speaker as Delsin absorbed the power), and there’s tons of other developers out there doing neat stuff with it. I loved how Transistor played the narrator’s voice through it (only if you select to use the speaker in the options menu), but still sent the reverb sends to the main mix. It created a fantastic sense of your sword intimately talking to you, but still being in the world (and by only having the dry mix go through either the mains or the controller they avoided the sync issues of sending the VO through both). The Last of Us Remaster did a similar feature with their audio logs. Shadow of Mordor had a great example of a first person notification in playing a bush rustle sound whenever the player would enter high grass. It helped communicate to the player that they were in cover using an in-world sound rather than a possibly-immersion-breaking UI sound. The bush rustle sound also brings up one last point: while it is a decent quality speaker, it’s still a small speaker in a plastic housing, best to keep it relegated primarily to mid and higher frequencies. Perhaps we need to give the speaker controller a fancy acronym akin to LFE to help explain its best uses, something like Personal Mid-to-High-Frequency Effect (PMtHFE). Although that’s more syllables than “speaker controller,” so let’s just remember to use it wisely. Of all the powers in inFamous Second Son, Video powers may have been the most esoteric. I mean smoke at least has an analog in fire (and we used some fire elements in both the visual and sound design), but video? You think video, you may think laser, but we already had a neon power (which was even sometimes referred to as laser). So how the hell did we get something sounding as unique as our video powers without treading on the other power sets? Part of the answer is interestingly with how the power set itself was initially conveyed to the team. Video power was actually called “TV power” internally for most of production. Heaven’s Hellfire, the video game that Eugene, the video power conduit, is obsessed with was initially a TV show. We realized after many months that it made more sense to make it into a video game instead and that would open up more avenues for us to play around with in the gameplay (such as the mildly retro boss battle). But we still had “TV powers” stuck in our brain and when Andy and I began brainstorming about how to make sounds that were powerful and unique and “TV like” we started thinking about televisions. We stalked thrift stores around town hoping we’d come across some old 1970s vacuum or cathode tube televisions to take apart and record. We failed there, but Andy eventually came across a couple old CRT TV/VCR combos. Double obsolete points! We brought these into the studio and proceeded to record all kinds of sounds with an array of microphones from shotguns to contact mics to crappy telephone microphones which did an amazing job of capturing bizarre electromagnetic interference around the power supply, and other surfaces. We recorded all possible permutations of power on and power off sounds and even got the VCR mechanisms to give us some very bizarre whines and hums. We also did some recordings of the Sucker Punch MAME arcade cabinet which has a very old CRT monitor in it with tons of wires exposed, as well as a shortwave radio I’ve had for years, but never really needed for a video game sound before. We recorded all of these sounds at 192kHz and the frequency content of the recordings on the CRT monitors at the higher frequencies was pretty astounding. While some of them we had to remove the >20kHz content to save our ears and speakers, Andy also did some pitch shifting to play around with some of these normally inaudible sounds and they became part of the video power palette. A few words on the telephone microphones we used: they are cheap and really neat for recording electromagnetic interference. Although Radio Shack may be dead and gone now, you can still get them online. It’s pretty neat the wide array of sounds you can get from one of them by waving near essentially any power source from a monitor to a computer, plugs, etc. Basically any electronic device will give you some interesting content. For a lot of the TV powers, Andy took various EMF sounds and morphed them together using Zynaptiq’s Morph plugin. So, similar to our other power sets, below is a video showing some of our field recording as well as the final in-game sounds. What’s different here is that the video powers were finalized later in the project and we were so focused on finishing the game, that we did not make a fancy, fun video for the team. So, it may not be as fun as the previous videos, but still shows what we recorded and how it ended up sounding.